Guadeloupe is a Caribbean island located in the Lesser Antilles, with a land area of 1,628 square kilometres and a population of 403,977 inhabitants. It is an overseas region of France, consisting of a single overseas department. As part of France, Guadeloupe is part of the European Union and the Eurozone; hence, as for all Eurozone countries, its currency is the euro. However, as an overseas department, Guadeloupe is not part of the Schengen Area. 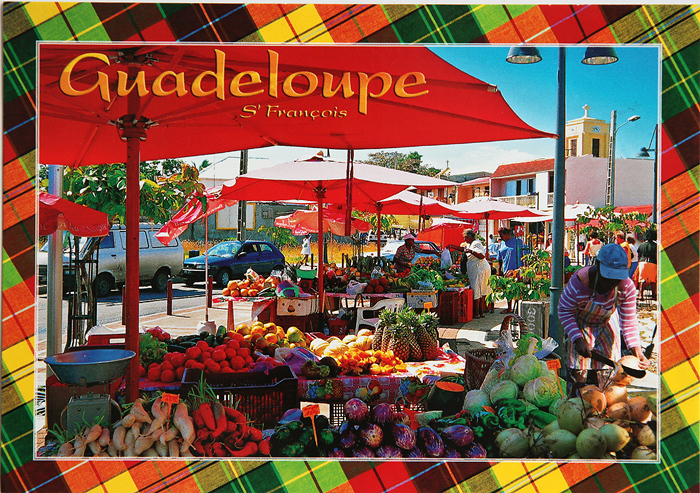 The official language is French, although many of its inhabitants also speak Antillean Creole (Créole Guadeloupéen). During his second trip to America, in November 1493, Christopher Columbus became the first European to land on Guadeloupe, while seeking fresh water. He called it Santa María de Guadalupe de Extremadura, after the image of the Virgin Mary venerated at the Spanish monastery of Villuercas, in Guadalupe, Extremadura. The expedition set ashore just south of Capesterre, but left no settlers behind. This entry was posted in Guadeloupe and tagged Antillean Creole French, Caribbean, Christopher Columbus, fruit market, Guadeloupe, Leeward Islands, Lesser Antilles. Bookmark the permalink.